In this site you can find information about the great potential of thermography in the verification of the thermal insulation and degradation by determining the areas with surface temperature anomalies due to various factors (thermal bridging, moisture, delamination, surface coatings, …). In this article we use the blower door to be a valuable aid to further expand the information acquired through thermal imaging. What is the blower door? It’s an apparatus that is installed in correspondence of a door (or window) outside the building allowing the airtight housing of a large fan. The installation does not create damage to housing and takes place by means of an adjustable frame, which adapts to the size of the door; it comes then closed with a sturdy nylon cloth with a hole for the housing, always airtight, the fan. The apparatus thus installed (see photos below) restores the external integrity of the building envelope and allows at the same time to vary the internal pressure, compared to the external pressure, with a system that may be controlled by PC. Namely: by operating the fan so that expel air from inside the building to the outside, the pressure inside drops. In this way, the outside air tends to enter inside to balance the pressures. This equipment allows then to “create” at will the conditions that cause infiltrations of air, present when the outside there is a strong wind, with the difference that the wind force the external air to enter the building only on the windward side while on the lee side the air inside to come out (see figure below). With the blower door, however, the building is subject to all sides to the same pressure difference, as it would be in the ideal situation of wind blowing against the building equally from all sides, which is impossible in reality. The air that enters the building as a result of the blower door (which will create a vacuum inside), if it is at a temperature lower (or higher) from the inner cooled (or heated) by convection internal surfaces with which it comes contact, making them visible with thermography before they were. 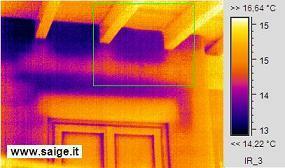 This image thermographic recovery without running the blower door, shows the interior of a house with wooden roof: cold areas under the roof are the thermal bridge of reinforced concrete curb. In the area of the green box are not noticed anomalies, apart from the thermal bridge. 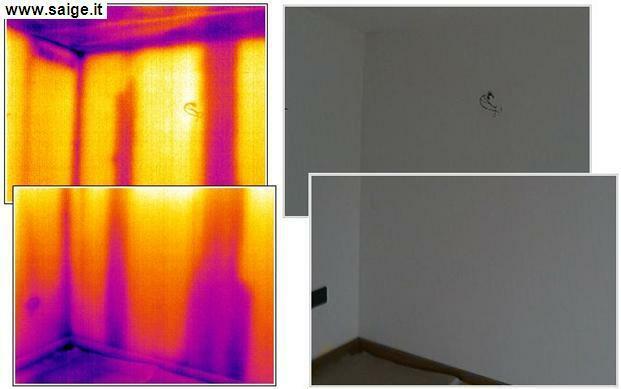 The underlying image represents the same area of the green box, investigated with thermography during the creation of a difference of negative pressure inside the dwelling with the blower door: is clearly noticeable streaks where the cold outside air, at a temperature below , cooled areas with which it came in contact. Even the points of infiltration are easily identifiable. Note that it is not necessary there is wind because within air from infiltration: is a sufficient temperature difference between inside and outside air, or steam pressure. In fact, different air temperatures lead to a different density than air and therefore the tendency of the air to exchange places in order to balance its density, as the different vapor pressures tend to balance with similar mechanism: the nature always tends to ‘balance. The transport of steam through a slit is about 100 times higher than that due to the vapor permeability of a normal building material, and this, in addition to problems of energy expenditure, due to problems such as interstitial condensation, or condensation inside the thickness of a wall or a roof, with degradation of the insulating characteristics of the materials. 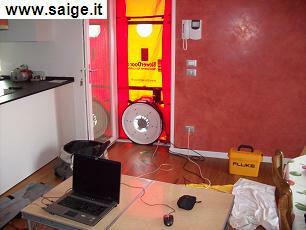 It ‘well known that the insulating capacity decreases with the increase of the moisture content. The thermal bridges, being caused by the structural characteristics and not by the wind conditions (that is to say by pressure differences) do not change if the blower door is used or not, and the thermography sees them always in the same way. The blower door is a tool that is designed to be coupled to thermography: in fact it is a device created to meet the requirements of UNI EN 13829 states that the test method for the measurement of air permeability of buildings. The air permeability is measured with the numeric parameter n50: This parameter expresses the number of air changes per hour of the internal volume of the building with a pressure difference of 50 Pascal respect to the outside (hence the term n50 ). 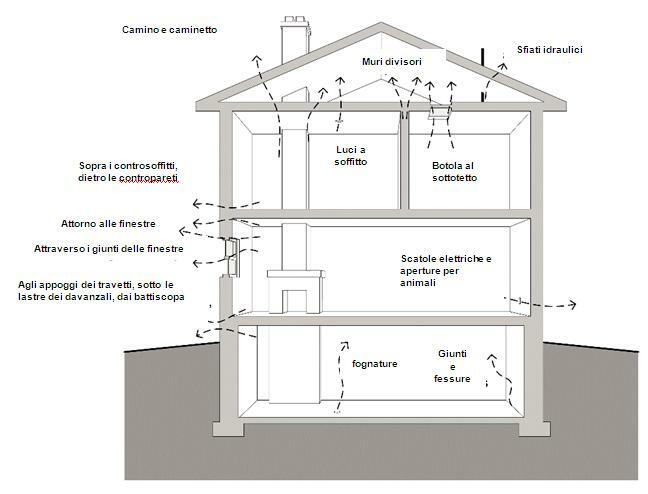 So the higher the number n50, the more the building drafts and is therefore subject to loss of energy and comfort problems, so the n50 value is low, the more the building is airtight and “frugal”, until you have need of a mechanical ventilation system controlled to ensure the correct temperature and humidity conditions. 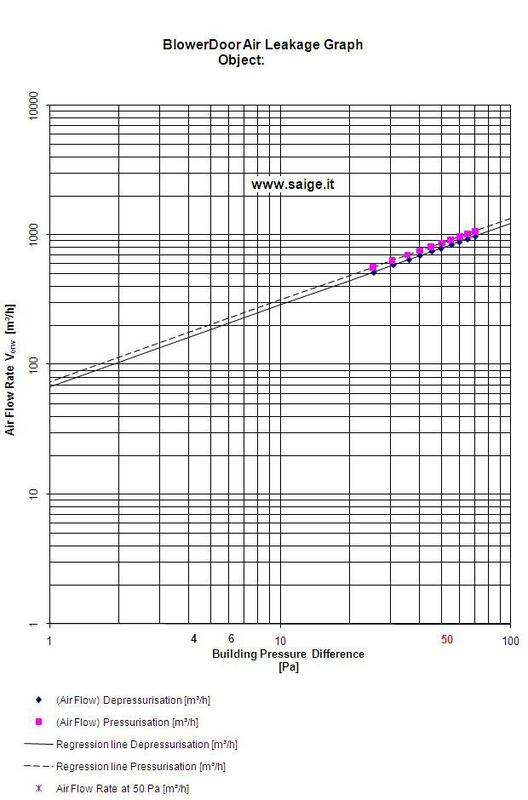 At the end of the blower door test has a chart with a diagram of regression between the differences of pressures (on the abscissa) and the air flow rate, both with building positive pressure relative to the outside (line with square purple) that with pressure negative (blue line with diamonds). The mutual position of the two lines, or the different quantitative behavior of the building under pressure or depression, you can get information on the mechanisms prevailing infiltration and its causes (windows, roof, …). We already know what a thermal bridge and what air infiltration. There is a third type of problem that causes a deterioration of the building’s energy performance, thermal bypass, Anglo-Saxon term to describe a phenomenon that causes a “crossing” of thermal insulation, without being air infiltration (within proper) or a thermal bridge. bypass termico Image courtesy of Mark Sidall, “Thermal Bypass-the impact of natural and forced convection upon building performance” in Green Building Magazine (Summer 2009). The thermal bypass occurs when the air passes through part of the thickness of the envelope (walls and roof), without going inside the building, or on entering a small part for the few slots. This means that the air transits within cavities in the walls or in the roof (for natural convection or by wind pressure), causing a cooling of the cavity, sometimes a cooling of the internal surfaces by conduction through the inner wall of the interspace, and a deterioration of the performance of the insulator present in the cavity, with consequent negative effects on the energy performance of the dwelling, and possibly causing other problems. 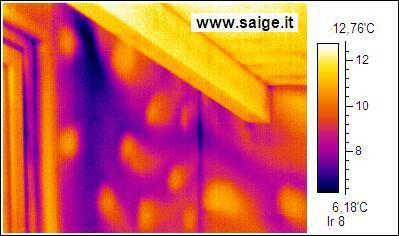 Are visible in the thermal image above convection of cold air behind a false-plasterboard. One sees that the motions to originate at floor level (under which there is a garage is not heated) and to come up to the ceiling, also with relining plasterboard causing a deterioration of the insulation even if you do not have a large input air inside the dwelling. 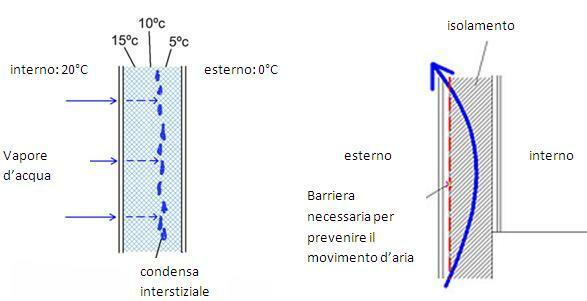 Instead the thermal image below the convective motion of cold air behind the counterwall takes place from the point of junction between wall and roof (with flow area at a lower temperature) for incorrect laying of the barrier air. The appearance of “bubble” is due to the glue with which the plasterboard wall is fixed to the rear.